This episode is an experiment in time travel. Because Kelly's Dead Relatives Tour conflicted with the recording schedule, the Two Ewes prerecorded this episode. The Duff Green Mansion B and B where Kelly was staying. Marsha shares her experiences of the shops she visited on the Puget Sound LYS Tour. All Wound Up in Edmonds. The two patterns Marsha bought are a poncho called Stone Point by Courtney Kelly and a cardigan called Harebell by Amy Christoffers. 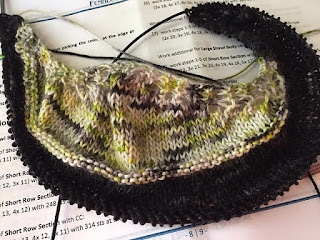 She bought a skein Madelinetosh Twist Light called Void to pair with her Apple Fiber Studio MacIntosh in the color way Moss on a Rock. 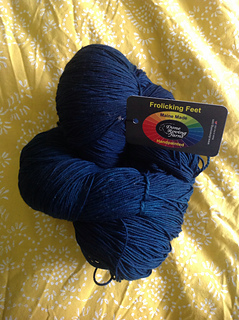 She also purchased a giant, luscious skein of Done Roving Yarns DK Frolicking Feet Sweater pack. The skein is 1500 yards and weights over two pounds!